FiC president Jaume Ferrer and councillor of education and culture Sònia Cardona, together with Esperança Suñer, headmistress of the Escoleta de Sa Miranda nursery school in Sant Francesc, and Hector Martínez Company, staff specialist in infrastructure, paid a visit this morning to the Casal de l'Esport of the municipal football pitch, a locale dedicated to hosting sports-related activities on the island. The visit was intended as an opportunity for the individuals to share their expertise in education and infrastructure and weigh the possibility of adapting the locale for use as a summer school for infants ages one through three. The local summer school (or escola d'estiu) programme is currently only open to school-age children, although a significant number of parents have expressed a need for a more encompassing service. In the words of Jaume Ferrer: “The ideal situation will be to have an early-learning centre designed expressly to meet the needs of our youngest children. That is what we'll have [with the new school] in Sant Ferran but it's not yet a reality. However, this doesn't need to stop us from providing a service that our local population is saying is necessary”. 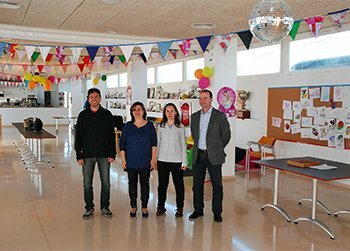 Sònia Cardona reflected: “The idea is for the space to serve as an early-learning centre until the new escoleta in Sant Ferran is finished, and this is what we've communicated to the technical specialists working on the project. Their work now is to decide what changes will be necessary so that the Casal can become a safe, adapted centre for our children”. The technical crew of educational and infrastructure specialists provided an extremely positive evaluation of the Casal space, citing its spaciousness, light and inner courtyards as advantages and noting that primary changes would need to include a remodel of the toilets and separation walls to create individual classrooms.